I mentioned in the Rubybox Unboxing post that I’d be doing a review on the new Pond’s BB cream. I was lucky enough to take advantage of a promotion Clicks was running at the time, where you could purchase a face wash and the BB cream for R 134,99. I’m a sucker for special offers and packaging so I was definitely drawn to these pink beauties. This post is mainly dedicated to the Pond’s Flawless Radiance BB Cream but I thought since I bought the 2 products as a set, I might as well review the Pond’s Flawless Radiance Even Tones Facial Foam as well. Definition of a BB cream: BB stands for blemish balm / beauty balm. A BB cream is almost like a tinted moisturiser on steroids – it hydrates the skin, evens out skin tone, usually offers a broad-spectrum SPF plus some BB creams provide soothing or healing properties. What Pond’s says: A light, non-oily, multi-benefit cream. Experience instant, natural coverage that is specifically designed to match your African skin tone, whilst our GenActivTM COVER formula evens skin tone and reduces dark marks from within. More info: I have this in the shade Beige and although it’s quite yellow-toned, it blends in perfectly well with my skin (I have a neutral- to warm undertone). There are currently 2 shades available – 1 shade for light skin tones (Beige) and 1 shade for dark skin tones (Chocolate). It contains an SPF30, which is always good – noone wants wrinkly skin by the time they’re 40! 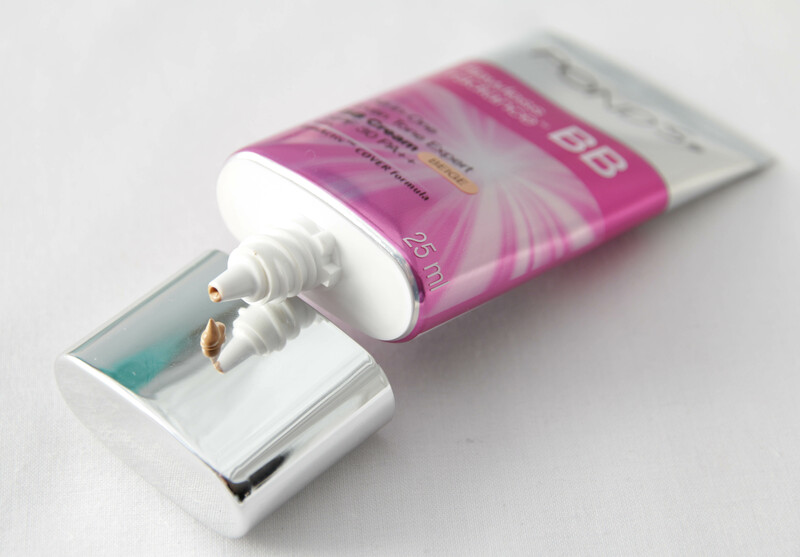 My review: I like this BB cream, it’s different than the other BB creams on the SA market. The Garnier BB cream leaves a dewy finish where this one gives your skin a more matte finish. This BB cream also offers more coverage than the Essence BB cream but less coverage than the Garnier BB cream. Because it leaves my skin with a matte finish, I hardly have to set it with a powder (only my T-zone) and it’s quite long lasting. I usually wear makeup for around 10 hours a day and it still looks good by the time I wash my face. If you have oily skin, you might need to touch-up with powder around half-way through the day. I find it looks best when applied with a buffing brush to really buff it into the skin, but can also be applied with your fingers (just make sure you massage it into the skin). The Pro: This BB cream blends well, provides medium coverage and doesn’t fade throughout the day. Because it is yellow-toned, it covers redness quite well. The Con: The only con I can think of would be that there are only 2 shades available. The Beige shade is quite yellow-toned and although the BB cream blends really well, someone who has strong pink undertones to their skin will not be able to make this one work. The Price: R 89,99 for 25ml (available at Clicks, Dischem, Foschini and Truworths). What Pond’s says: Gently cleanse your face twice a day with soft exfoliating beads to remove unwanted, dead and dull skin cells, while washing away dirt, oil and impurities. This facial foam with GenActiv™ formula is the first step to reveal a brighter skin appearance for a fresh and luminous complexion. My review: There are tiny micro-beads in the facial foam, I wouldn’t say it will give you a proper exfoliation session but it does leave the skin feeling super soft. I was quite surprised after using this for the first time and I’ll go as far as to say I like it more than my Bioderma face cleanser. It has a subtle floral scent and is more creamy than foamy (I would compare the consistency of this to the Clinique Rinse-off Foaming Cleanser). I did a little test after cleansing my face: I wiped my face using a cotton pad soaked with Bioderma Sensibio H2O cleansing water and I’m happy to report there was no makeup on the pad. I always test cleansers this way to see whether they really remove all the makeup and dirt. The Pro: It leaves the skin feeling well cleansed and soft. It’s also very reasonably priced when compared to the likes of Neutrogena and Garnier, not to mention Bioderma. The Price: R 56,99 for 100ml (available at Clicks, Dischem, Foschini and Truworths). All in all, I’d say well done to Pond’s for creating a BB cream that can firmly stand it’s ground around the likes of my Skin79 BB cream and Lioele Beyond The Solution BB cream (these will definitely be taking a back seat for the considerable future). Pond’s have been around for many, many years and good value for money! I also use the Facial Foam as well as Pond’s Age Miracle Deep Action Night Cream – lovely velvety stuff! Yes, definitely leaves your skin feeling velvety! Thanks, Ziyanda! You should def try it out! I swatched this BB cream in the store but it is too yellow for me. Im so disappointed. When will we be seeing your monthly favourites? I just thought I would comment on this blog post, I always read your blogs but I never comment. Your reviews are so interesting and informative; your photos are incredible. I truly enjoy checking in on your blog. Do you know if Ponds will create a BB cream for women with a pink undertoned skin any time soon? This one is just too yellow for me as I have red hair. Which Truworths is having ponds radiance in Pretoria?